September 6, 2018: Three Tries to Successful Drill Atop Vera Rubin Ridge: Heedless of the (now-dissipating) dust storm, Curiosity has achieved its first successful drill into rocks that form the Vera Rubin ridge, and is hopefully on the way to a second. 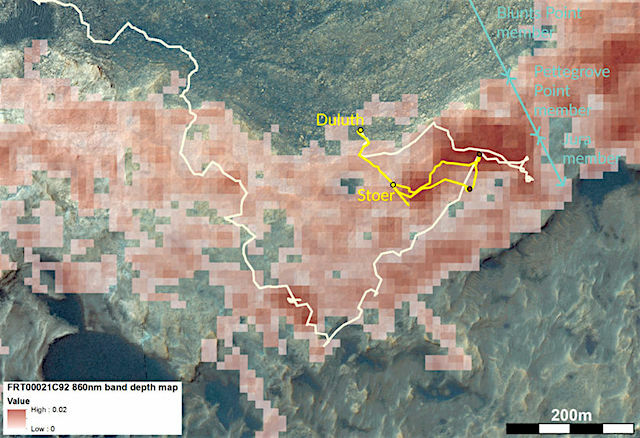 It took three attempts for Curiosity to find a soft enough spot, with Voyageurs and Ailsa Craig being too tough, but Stoer proved obligingly soft on sol 2136. The rover delivered samples to both of its analytical laboratory instruments before driving away. This entry was posted in Reports and tagged Aeolis Mons, Ailsa Craig, Curiosity, Duluth, Gale Crater, hematite, Mars Science Laboratory, Mount Sharp, MSL, Murray Formation, NASA, Stoer, Vera Rubin Ridge, Voyageurs. Bookmark the permalink.